As a reference: It’s all here: the ins, the outs, the do’s, and the don’ts. The world of college savings is one of very specific rules, and they’re here, in all their glory, and they’re all explained. As an advisor: It’s a case of the very good savings techniques, the merely okay savings techniques, and the truly ugly techniques (which you really want to avoid), and this book highlights them all. As a little light reading: Amazingly enough, the topic of money can be mildly amusing, and college savings is no exception. Read this with an eye towards the absurd, and you won’t go far wrong. In this one-size-fits-all world, the powers that be have recognized that all people don’t save money the same way. Some save more, some save less, some can live with risk, and others can’t tolerate any risk. Clearly, no two are alike, but you’re all savers, either present or potential. Numerous options exist that make saving possible and desirable for everyone. 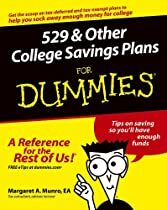 529 & Other College Savings Plans For Dummies is here to tell you that it is possible to understand the costs associated with college, both right now and in the future, and then find ways to pay for those costs.